Customer acquisition has always been a complicated process. A tactic that several marketers often unintentionally ignore is the one through referrals of existing customers. Brand advocates bring multiple benefits. This tactic is all the more important in the e-commerce industry as only one dominant player holds tremendous sway over the market. A study conducted puts Amazon’s share of the total to nearly three-fourths of the entire market. Their total revenue from e-commerce last year was put at just short of eighty billion US dollars compared to a measly fifteen billion plus of Wal-Mart. Amazon is a leader in marketing, but for other players to emerge and sustain their models, an effective advocacy model is required leveraging their most satisfied customers. Let us now individually look at all these strategies. It is a well known fact that mobile phones are increasing in their bandwidth of commercial sales. This can be confirmed through the marketing research conducted by Extole which states that in 2015, their overall share of all e-commerce stood at a fourth of the market but has now increased to just short of a third. Only eighteen percent of overall referrals are sent using smart phones but more than the double of that figure standing at just short of forty percent, is received by customers on those devices. People are constantly connected and on the move, so this trend must be capitalized on. Checkmate has got the art of native sharing extremely well. At the time the customer buys the product, is when he/she is most excited about it. So this is the time the brand must attach itself with incentives to refer. Research suggests that customers at this satge are sixteen times more likely to refer the product to any acquaintance. That is the reason that retailer Sephora is tracking experiences of customers immediately after purchase. This will provide the retailer valuable business intelligence on use patterns at this stage to optimize the referral procedure. Some in-store shopping tool or app must be developed to enable the seamless transition from the website to the store. This works both ways. A customer could be directed to the store from the initial screening at a site, while some others may start out at the store but need more detailed help using the app. Kipling has got this strategy perfect. Their referral method does not simply track CTAs, but instead has enabled buy buttons on each individual product mirroring the way friends actually talk to each other. It is commonly understood that customers refer the specific product relevant or of interest to them rather than an entire brand. Email continues to be one of the best means of digital marketing. This is in spite of so many new innovations coming up or terms such as native sharing in vogue, emails have not been displaced. Triggered mails are those which set off a chain of motions among the customer base. The first level is called the referral email followed by reward email which states the rewards on offer. Finally there is the stats email which shows the status of the rewards earned. This process gets completed with the purchase made by the friend to whom the product has been referred to. A stats drip is periodically sent to ease the tracking. Scheduled mails are created so that mails can reach the intended recipient base at the right time. A very important part at this stage is “friend email capture”. This needs to be done subtly by providing incentives to the existing customer such as a discount code. Loyal members over a lifetime provide up to eighteen percent greater value to the company, as stated by management consulting giant Accenture. This segment must be tapped by doling out regular benefit programmes. A points system suits perfectly with the intended plan. The entire referral process must be driven through an interactive interface involving real human faces, videos, informative content and a step-by-step training. In spite of the rise of Artificial Intelligence (AI) powered chat bots, human faces are still essential. People tend to connect much better when there is a real human face on the other side of the interface. That is why over half of Extole’s customer base is fitted with their real faces to drive engagement. The conversion rate increases by three percent in such circumstances. The use of business analytics must be made to study campaign and promotion trends. Extole has provided a dashboard which is very easy to view and avoids the entry of vast data on excel sheets. A visual representation is an ideal analysis medium. Everyday Advocates are those who share on a regular basis up to twice a day. 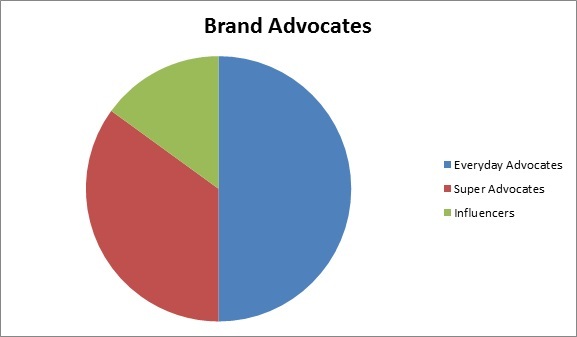 They make up the largest single chunk of brand advocates. Super Advocates on the other hand are those who share three or more times in a day. Surprise and delight campaigns work wonderfully to nurture such types. The highest category of brand advocates is Influencers. They have a massive fan following that they have created primarily through organic methods. They use their outreach to create brand awareness and promote the product accordingly. Influencers must be leveraged as much as possible. Marketing touch points must be used to nurture such influencers. Provision of advocate codes to everyone is a reliable method of executing such campaigns. They then need to be tracked accordingly in to the database. The concept of referrals is proving to be one of the masterstrokes of the retail industry. The year 2017 is primed to see further progress in this field. Extole is one of those market innovators that has created a seamless platform to engage with brand advocates.